Since right-hander Kyle Drabek was called up over the weekend by the Toronto Blue Jays from Triple-A Buffalo – and to continue an earlier post about the same topic – I wanted to discuss one of the best games his dad, Doug Drabek, threw during his major-league career. On September 30, 1990, Doug Drabek (now a pitching coach with the Short-Season Single-A Hillsboro Hops, Diamondbacks’ affiliate) pitched a complete-game three-hitter to beat the Cardinals 2-0 in St. Louis, clinching the NL East title for the Pirates. It was their first division title in 11 years, as Pittsburgh won its seventh straight game and 10 of 11. The Pirates’ only two runs came in the eighth off hard-luck Joe Magrane on a sacrifice fly and a groundout. The unfortunate Magrane fell to 10-17 despite a 3.59 ERA, but the big story was Drabek, who got the shutout by throwing only 80 pitches. It was also Drabek’s 22nd victory, and the right-hander would go on to win the NL Cy Young Award in 1990. That’s probably one of the best-pitched games of the decade – a complete-game shutout on only 80 pitches to clinch a division title – but it’s largely been forgotten. People might remember more about Mike Scott’s 1986 NL West-clinching no-hitter, because it was a no-no, but still, Drabek’s gem was spectacular. Speaking of the Cardinals, in 1990 St. Louis finished last in the East with a 70-92 record, with Joe Torre taking over in the latter part of the season as manager. Though the Cards were a last-place outfit, there was one highlight on August 17 at Busch Stadium, when Bob Tewksbury threw a one-hitter to beat Bill Gullickson and the Houston Astros, 5-0. That night, Tewksbury lost his perfect game bid when Franklin Stubbs doubled to left on the first pitch leading off the eighth, and the Cardinals right-hander went on to throw just 79 pitches to complete the one-hitter. Had he gotten the no-no, it would have been the second in the majors in three days, following Terry Mulholland’s gem against San Francisco. As it turned out, Stubbs would be the only Houston batter to reach against Tewksbury. But 79 pitches in a one-hitter, a near perfect game? It’s all been forgotten as well. Then on July 8, 1994, Tewksbury shut out Greg Maddux and the Braves 2-0 in Atlanta, where he used only 90 pitches in the complete-game four-hitter. It was a game where both he and Maddux went the distance, with neither one issuing a walk. What I find interesting, just over a month later, is that the Tigers and Athletics could meet in October…but in a one-game showdown for the AL Wild Card to advance to the Division Series. How interesting that would be if things turned out that way! Going into action on August 19, Detroit (66-56) and Oakland (73-51) were the two wild-card teams in the junior circuit, with the Tigers two games behind Kansas City (69-55) in the Central and the Athletics a half-game back of the Angels (73-50) in the West. The Tigers (.5409) are actually only percentage points ahead of the Mariners (67-57, .5403) for the second wild-card spot, following Seattle’s loss to Jerome Williams and the Phillies 4-1 on Monday night in Philadelphia. Detroit was idle. Should be an “interesting” finish to the season! “Tom Candiotti: A Life of Knuckleballs,” a biography of former big-league pitcher Tom Candiotti by KP Wee, is now available from Amazon.com or through the McFarland & Company website. Right-hander Jeff Samardzija, traded from the Chicago Cubs to the Oakland Athletics on July 5, was named to the National League All-Star team the following afternoon for the upcoming Midsummer Classic at Minnesota’s Target Field. Samardzija, who was 2-7 for the Cubs despite a 2.83 ERA in 17 starts (and 103 strikeouts in 108 innings), will be allowed to take part in the festivities but will not be pitching in the All-Star Game because of the trade which sent him from the NL to the AL. But hey, at least he became an All-Star for the first time. Some players never got a chance to even be named to the All-Star Game. Some 20 years ago, a guy with a good ERA but a low win total wouldn’t have been named to the team. Take Tom Candiotti, for instance, who was probably denied a shot at the 1991 Midsummer Classic because he was traded from the Cleveland Indians to the Toronto Blue Jays 10 days prior to the game. He also was unfortunate in that he pitched in the wrong era. SkyDome played host to the 1991 All-Star Game and the Blue Jays had three All-Stars – rightfielder Joe Carter, second baseman Roberto Alomar, and left-handed starter Jimmy Key. The Indians, meanwhile, had only one representative for the Midsummer Classic. Second-year catcher Sandy Alomar Jr., despite having a bad year – he’d spent time on the disabled list and was hitting .200 going into July, was voted into the starting lineup by the fans. A .476 hitting tear the first seven days of July – including a 4-for-4 performance in the final game before the All-Star break – helped pushed his average up to a more respectable .241 at the end of the first half. Nowadays, it seems to be a lot easier to make an All-Star roster. Take a look at the 2010 AL roster, for instance; there were a total of 42 All-Stars on that squad! Back in 1991, however, there were only 28 roster spots available on All-Star teams, which certainly cost Candiotti a spot. As the years went by, spots were added as the roster size went over the 30-man mark, so in the 2000s, there are far more players per club in the Midsummer Classic. In 2009, All-Star rosters increased from 32 to 33 players, but even that wasn’t enough. So, in the end, Verlander replaced Sabathia, Weaver replaced Cahill, and finally, Bailey replaced Weaver. Thanks to the new rule, Verlander and Bailey were recognized as All-Stars. Ditto Sabathia, Cahill, and Weaver, even though there were not part of the Midsummer Classic roster. A whopping total of 42 players – among them 18 pitchers – were recognized as All-Stars on the AL squad that year, including all the players who either were ineligible to pitch or couldn’t play because of an injury. In 2011, it was more of the same. In total, four starting pitchers in the AL and two in the NL were declared ineligible to participate in the All-Star Game because they pitched on the Sunday before the break, meaning they needed to be replaced. And even then, there were some complications. Sabathia replaced Tampa Bay’s James Shields on the roster because Shields was starting on the final Sunday. Red Sox pitcher Jon Lester replaced Mariners pitcher Felix Hernandez because he also started on Sunday. But Sabathia just happened to pitch on Sunday too, meaning he was essentially a replacement needing his own replacement (which turned out to be Alexi Ogando of Texas). Lester happened to be on the disabled list, meaning he needed a replacement too (Ricky Romero of Toronto). So, the week after the initial announcement of the All-Star rosters, there were still players being added, and replacements needing to be replaced. That last part is probably right. Despite the new rule regarding pitchers and the increase in the roster size, there is still controversy over the player selection process. In fact, there has been for years, before and after the expanded rosters in the 2000s. In 2006, Kansas City pitcher Mark Redman was an All-Star despite an ERA of 5.27 and a 6-4 record at the break. Why was he an All-Star? Well, the rules state that each team has to have at least one representative on its league’s All-Star roster. In Redman’s case, he was the Royals’ lone representative, a year after going 5-15 in Pittsburgh. Speaking of the Pirates, they had their own controversial All-Star in 2003, when closer Mike Williams was selected for the Midsummer Classic as Pittsburgh’s lone representative despite his 6.44 ERA. That rule – where each major-league team needed at least one representative – was one that Candiotti also had to deal with when he was still pitching in the big leagues. Candiotti certainly missed out in 1991 because of that rule. For instance, the ’91 Yankees were a fourth-place outfit in the AL East that didn’t deserve to have any players representing them in the Midsummer Classic. The Yankees, in fact, didn’t have any players voted in. However, since each team had to send at least one player, right-handed pitcher Scott Sanderson, 9-3 with a 3.93 ERA, was selected for the American League squad as the Yankees’ lone representative. While Sanderson’s won-loss record was great, he was far from being a dominant pitcher, averaging just over six innings per start with opponents hitting .276 against him. The knuckleballing Candiotti, on the other hand, was averaging over seven innings – 121.1 innings pitched over 17 starts – while posting a 2.23 ERA. Opponents were hitting only .224 off Candiotti. Thus, with Sanderson’s inclusion (which turned out to be the only time in his career he was an All-Star), a far more deserving pitcher like Candiotti was not selected. If there was no rule insisting each team had to have at least one player chosen as an All-Star, it’s very likely Candiotti’s 2.23 ERA – not to mention all the other stats except for walks – would have put him ahead of a pitcher with an ERA approaching 4.00. He does offer up another explanation, however. It goes back to when Boston Red Sox catcher Rich Gedman had trouble handling Texas knuckleball pitcher Charlie Hough in the Midsummer Classic in 1986. Hough struck out three straight batters in the eighth inning, but gave up two runs and couldn’t get out of the inning. With a runner on second base, Hough struck out Chili Davis for the first out, but the ball got past Gedman for a wild pitch. Hough then struck out Hubie Brooks, but the ball again got away – this time Gedman was charged with a passed ball – allowing the runner to score and Brooks to get to first base. Hough fanned Tim Raines for the second out before Steve Sax hit an RBI single to knock the knuckleball pitcher out of the game. “A catcher just couldn’t catch a knuckleball pitcher if he wasn’t his personal catcher. A knuckleball pitcher really needs his own personal catcher, and so over the years after that, managers and his coaches weren’t going to pick a knuckleball pitcher. That’s right, oh well. So Jeff Samardzija – unless the rules are changed for him – won’t pitch in the 2014 Midsummer Classic. But hey, at least he was named to the National League squad. Some people just aren’t – or weren’t – lucky enough. The Indians apparently had no other guys that could make the All-Star team in 2010. Right-handed starting pitcher Fausto Carmona was the Indians’ lone representative at the Midsummer Classic, despite posting unspectacular numbers. At the break, Carmona was only 8-7 with a 3.64 ERA in 18 starts. By season’s end, the numbers would be 13-14 and 3.77. Those are numbers for an All-Star? And it wasn’t as though he made the team based on a great 2009 season, as he was 5-12 with a 6.32 ERA in 24 starts in ’09. “Rangers Righty Alexi Ogando Joins AL All-Stars,” Associated Press/Yahoo! Sports, July 10, 2011. In the 2011 season, almost the same thing happened with Sabathia. This time, CC wasn’t named to the All-Star team originally but was later added to the team as the replacement for Tampa Bay pitcher James Shields. However, Sabathia and Shields both pitched in the Yankees-Rays contest on the Sunday before the All-Star break, making them ineligible for the game. Thus, Texas pitcher Alexi Ogando was named to the AL squad as a replacement for Sabathia. “Verlander, Weaver, Bailey Added as AL All-Stars,” Associated Press/Yahoo! Sports, July 11, 2010. Thanks for your services…but down you go to Triple-A! Left-hander Tommy Milone, who as recently as two weeks ago was thought of as “Mr. Reliable” of the Oakland A’s pitching staff, was sent to Triple-A Sacramento on July 5 to make room for right-hander Jeff Samardzija, who along with righty Jason Hammel had just been acquired in a trade from the Chicago Cubs. The 27-year-old Milone was 6-3 with a 3.55 ERA in 16 starts this season for the A’s, and had tossed six shutout innings the day before in Oakland’s 1-0 win over the Blue Jays. Since beginning the season 0-3, the lefty had gone 6-0 with a 2.62 ERA with the A’s going 9-2 in those starts. It is expected Milone would be back at some point later in the season, but this reminds me of another stunning demotion in Oakland which took place 15 years ago. Back in 1999, going into the season the A’s starting pitching was led by veteran lefty Kenny Rogers and knuckleballer Tom Candiotti, but beyond those top two spots Oakland seemed very thin in that department. Jimmy Haynes (5.09 ERA in 1998), Gil Heredia (22-24 lifetime and only 45 career starts), and Brad Rigby (5-6 with a 5.94 ERA in Triple-A Edmonton and injured most of 1998) were expected to be the Nos. 3, 4, 5 starters, respectively. 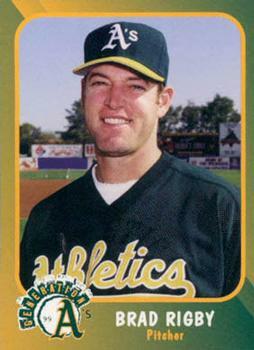 Mike Oquist, 11-17 with a 5.76 ERA in 1997-98 with the A’s, had been reassigned to minor-league camp to start the season. With Haynes, Heredia, Rigby, and Oquist not having a lot of big-league experience and with Rogers expected to be traded once the A’s fell out of contention, Candiotti was looked upon to pick up the staff. Unfortunately, Candiotti wouldn’t be the innings-eater the A’s were hoping for in 1999 – and it ultimately affected Rigby the most because he had to make emergency relief appearances when Candiotti came out of ballgames early. What happened was Rigby went on to lose his spot in the Oakland rotation permanently – thanks to Candiotti. The trouble started on April 11 in Seattle, when Candiotti ripped a fingernail while warming up before his start against the Mariners. Because of the torn nail, he couldn’t throw the knuckleball and had to rely on his fastballs. The Mariners, delighted at seeing the mediocre fastballs that the 40-year-old Candiotti was serving up, ripped him for six runs on seven hits in his 2.1 innings of work in their 11-8 victory. Because of Candiott’s ineffectiveness and early exit, Rigby – the scheduled starter for the A’s game against Anaheim two nights later – had to come in and pitch in relief of the knuckleballer in order to save the rest of the bullpen. Rigby was pounded for four runs on seven hits in 1.2 innings, and not only was he deprived of his starting assignment against the Angels, he would also be sent to the minors the following day, losing his fifth-starter spot (and major-league roster spot) to Mike Oquist! Rigby, who had beaten out Oquist as the A’s No. 5 starter in spring training, would be back with Oakland soon enough – he was recalled a week and a half later – but would be pitching exclusively out of the bullpen as a long reliever. Meanwhile, the Seattle game wouldn’t be the last time that Candiotti put Rigby in a bad spot. Two weeks later, when he had to leave a start in the first inning against Cleveland, Rigby again came in and was ripped for five runs in 5.1 innings. But at least Rigby was able to save the bullpen by pitching deep into the game in relief. “A couple of days ago, they tell me I’m starting [against the Angels],” Rigby said the day manager Art Howe informed him he was being sent down to Triple-A. “Then I go and throw in the bullpen. Do my arm and shoulder exercises. I ice. I’m in the dugout, ready to watch the game. As it turned out, Brad Rigby would not start another game in the majors, and would be traded on July 31 with two other pitchers to the Royals for Kevin Appier. Rigby, who had gone 1-7 in 14 starts for Oakland in 1997, would go 4-6 with a 6.01 ERA in 59 relief appearances in 1999-2000, and would appear in his final big-league game with the Montreal Expos on June 24, 2000. As for Mike Oquist, he started – and won – his game against the Angels, beating knuckleballer Steve Sparks, 3-2. So, that means Oquist had two knuckleball pitchers to thank for his victory; Candiotti for his early exit making Rigby unavailable to pitch and getting him called up, and then Oquist himself throwing well enough in out-pitching the knuckleballing Sparks. Well, try telling that to Rigby. And to Tommy Milone in 2014. But even that’s not the end of the story. 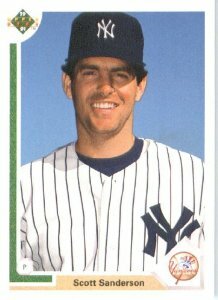 Mike Oquist, who had the second-highest ERA (6.22) in the American League in 1998, would be done following the ’99 season at the age of 31. He went 9-10 with a 5.37 ERA that year and never pitched in the big leagues again, instead toiling in Triple-A Toledo for the Tigers organization in 2000 and losing 15 games. Frank Blackman, “A Funny Way to Thank Rigby,” San Francisco Examiner, April 13, 1999. Mark Fainaru-Wada, “Luck Helps Oquist Nail Down Win,” San Francisco Examiner, April 14, 1999.